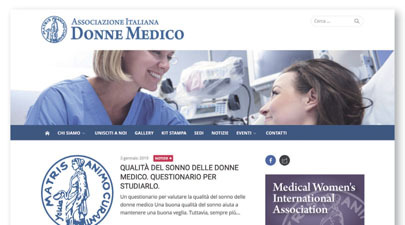 The Italian National Association of Women Doctors (AIDM) is a scientific society founded in 1921 to respond to the cultural need that emerged following the entry of women into the medical profession. It has been a member of the Federation of Italian Medical-Scientific Societies (FISM) since 2003, with membership no. A017. AIDM provides a space where women doctors can exchange views and discuss the issues that exclusively involve females in the medical profession, such as emancipation and empowerment, career progression, the contrast of prejudice among colleagues and patients, appreciation of the women doctors’ voice in the scientific community, the work-family blend, safety in the workplace and everything else that can contribute to giving value to the work of the woman doctor in the health field and promote collaboration between women doctors. AIDM is a member of the Medical Women’s International Association (MWIA) and since 2016 has led the MWIA Scientific and Research Committee in its capacity of Vice Presidency for Southern Europe. It is pluri-disciplinary in nature and involves women doctors in the general physician field as well as women doctors involved in all medical-surgical specialties. The interdisciplinary character of our association makes it particularly useful in dealing with cross-disciplinary matters, as indeed it enjoys the participation of the many areas of competence of its members. An illustrative example is gender medicine, a subject that has been discussed in conferences spanning the whole national territory and which permeates many sectors in line with the field of interest of that particular section: cardiology, neurology, bone diseases, chronic illnesses, etc. AIDM’s commitment to the safeguarding of women’s health is enshrined in its mission statement: the Association promotes study of health issues involving the whole community and in particular women, encourages scientific-cultural training in the health field by collaborating with public organisms and institutions and by carrying out trials and guidelines. AIDM’s work is devolved into provincial sections, which are however operatively autonomous, which normally does not exist in the other scientific associations. This organisation guarantees greater territorial penetration, with a continuous flow of training and information from the centre to the members and vice versa. Gender medicine has promoted collaboration and cultural exchange between members through meetings, updating courses and conferences on the subject, which has enabled the promulgation throughout the national territory of principles that underpin the development of medicine orientated towards gender. AIDM’s commitment also relates to social and social well-being issues that involve the community and in particular women. In these years of activity, and following the international recommendations of the MWIA, all sections have committed to the issue of gender violence. Working online with anti-violence centres, the police, provincial and council authorities, school boards and others has led to the establishing of memoranda of understanding that are by now active over the whole national territory. Guidelines for hospital reception of the victims have been set up in many sections and, with the publication of guidelines for hospital administrations, AIDM’s commitment is to surveillance of their application and to training healthcare personnel. AIDM adopts the quality assessment system in planning and carrying out its scientific and training activities. Since January 2011 it has been accredited as a provider standard, listed at no. 558 by the Commissione Nazionale per la Formazione Continua (National Commission for Continuing Education) and is thus authorised to set up training services that are recognised as suitable for continuing education in medicine. The AIDM is organised in provincial sections which organise conferences, seminars and study groups over the whole national territory and participate in scientific projects and collaborations with other scientific companies. The National Conference is organised on a yearly basis and is followed by the National Assembly.